APOPKA, Fla.--(BUSINESS WIRE)--Sep. 5, 2018-- KB Home (NYSE: KBH) today announced the grand opening of Carriage Hill, the builder’s latest community of new single-family homes in Apopka. Carriage Hill’s easy access to U.S. Route 441, State Road 429, State Road 414, and Semoran Boulevard makes it convenient to area employment centers and to a variety of shopping and dining options, including Altamonte Mall and Winter Garden Village. Residents of Carriage Hill can enjoy the community’s planned amenities, which include a playground and picnic area. In addition, school-aged children can attend desirable schools within a few minutes’ drive, including Wolf Lake Elementary, Wolf Lake Middle and Apopka High School. Nearby Northwest Recreation Center has walking trails, sport courts and fields, playgrounds, and an amphitheater for live music and special events, and Wekiva Springs State Park offers 13 miles of hiking and biking trails, as well as canoeing, fishing and snorkeling in Wekiva River. KB Home will host a grand opening celebration at Carriage Hill on Saturday, September 8 and Sunday, September 9 from 11:00 a.m. to 3:00 p.m., during which attendees may tour the two elegantly appointed model homes. Refreshments and family entertainment will be provided. 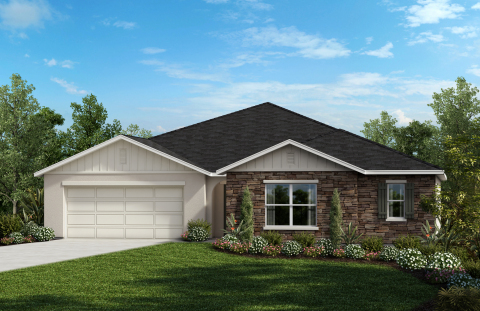 At Carriage Hill, KB Home will be constructing one- and two-story homes, and offering eight distinct floor plans ranging in size from 1,800 to 3,700 square feet, with up to six bedrooms and four baths. Spacious great rooms, beautiful master suites, and dedicated laundry rooms are among the desirable features characteristic of all the KB homes at Carriage Hill. Pricing begins in the low-$280,000s. The KB homes at Carriage Hill will be built to current ENERGY STAR® guidelines and include WaterSense® labeled faucets and fixtures, meaning they are designed to be more energy- and water-efficient than most typical new and resale homes available in the area. These energy- and water-saving features are estimated to save homebuyers between $900 to $1,500 a year in utility costs, depending on the floor plan. Carriage Hill is located off Rogers Road in Apopka. From I-4, take Highway 408 West to FL Turnpike North. Merge onto Highway 429 North and exit Plymouth Sorrento Road. Turn left on Plymouth Sorrento Road, right on Lester Road and left on Rogers Road. The community is on the right. The Carriage Hill sales office is open Saturdays through Thursdays from 10:00 a.m. to 6:00 p.m. and on Fridays from 12:00 p.m. to 6:00 p.m. For more information about Carriage Hill, or KB Home’s other new home neighborhoods, visit www.kbhome.com or call 888-KB-HOMES.